The first step is to create your Etsy store. Registering as a seller on Etsy is not a difficult process. Simply provide the details required by this marketplace and follow along the process. However, listing your bulk products of Shopify on Etsy for the first time can be difficult. For this, take the simple step to install ExportFeed app on your Shopify store. After that follow along with the intuitive process of creating product list and uploading them to Etsy. The most important step in starting a multi-channel marketing campaign is identifying which product will perform better in the selected marketplace. As Etsy is well known for the handmade and antiques, if you have listed the on your Shopify store they should be your first choice to for Shopify product feed for Etsy. Apart from that, as Etsy is also open to a wide range of product categories now, you should also perform a quick check on the “Popular Right Now” section and start listing those on Etsy. Listing products on your own Shopify store and listing them on Etsy is a bit different. On Shopify, you choose what information to show and what not to but in Etsy, you have rules to follow. Apart from the required product attributes, Etsy also needs information such as when was the product made, who made it and others. If you start using ExportFeed Shopify App, you have an easy way to send this information to the Etsy marketplace. Listing your products on Etsy is not the apex of multi-channel marketing implementation. You need to provide the required information and analyse what helps to convert the visitors into customers. For this make sure you check the products tagged as “Bestsellers”. Along with that, you should also create the products similar to yours. If you are selling handmade wooden frames, you should also check what sizes, what material information and what price they are available for. Getting started on Etsy marketplace is easy – no registration cost. But make sure that you know the details about the product listing too. Etsy charges $0.2 for every listing and it also charges you a nominal transaction fee after sales. But more importantly, to list your bulk products of Shopify to Etsy, you need to complete your shipping policy on Etsy. As, Etsy API only supports flat shipping plan for bulk products listing and selling, please make sure to create a flat plan for bulk products listing on Etsy. List your Shopify products on Etsy and keep a warm relations with the customers. Undoubtedly, ability to maintain sound customer relation is the key factor in whether your business grows or the growth gets stalled. Make sure that you provide clear information about product, pricing and shipping details on your listing. Along with that, pre and post customer service will go a long way to allow your business bloom on Etsy. 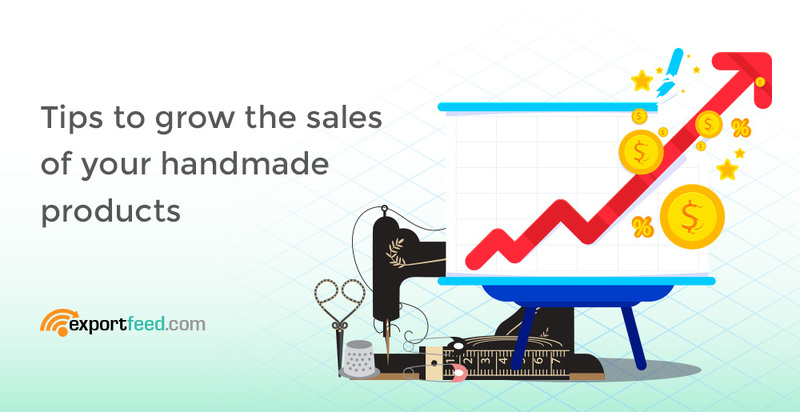 Why ExportFeed to increase the sales of your Handmade products on Etsy? ExportFeed installation is as easy as installing any app from the Shopify App store. Allows you to create Etsy product feed for up to 50 SKUs even on the trial plan & with support. You can map Shopify product attributes to that of Etsy & benefit from filtered search results. Ensure that you always send all the required information to make successful listing on Etsy. The best part: you can always be sure that your listings are up-to-date in terms of stock and orders.